Hmm well this is a little outdated already but I had two pieces of assesment due this week which is an excuse, actually. I can't speak for the rest of the world but eath hour was a big success with my street. Especially my apartment block; everyone had their lights out and they even turned out the hallway, outside, parking lot and pool lights. You know, all those lights which are there for safety. It was totally pitch dark and creepy. 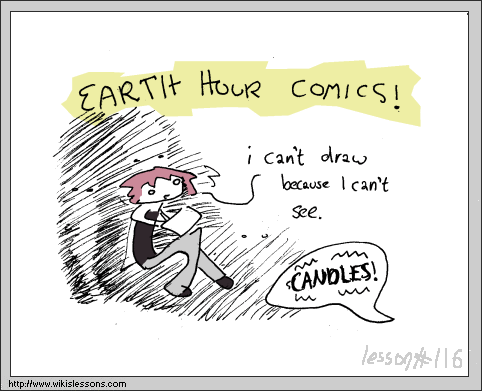 I think that if instead of posting pictures of the whole city, newspapers had just printed before and after photos of our apartments, everyone would have been a lot less disappointment about earth hour.